Like most high-level athletes, you probably HATE to make mistakes. When you have high expectations for your performance, it makes it hard to stay composed. Your competitive drive pushes you to further develop your physical and technical ability. However, some athletes who maintain extremely high expectations are prone to become frustrated and dwell on their mistakes. You might dwell on mistakes and beat yourself up for missing a break away or giving the ball away. The downward spiral of one mistake leading to another, and another, is all too common. 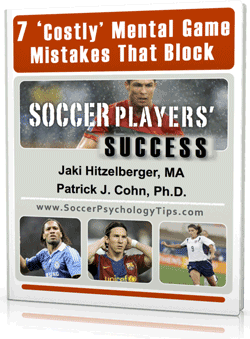 Some soccer players play tentatively and try to AVOID making mistakes. You might worry about letting down your coaches, parents, or teammates if you make a mistake. Trying to avoid mistakes will keep you from taking risks and cause you to play “safe”, which often leads to more mistakes. Dwelling on setbacks or mistakes inhibits your ability to focus and execute on the next play. Thinking about the LAST play or game will jeopardize your performance. The goal is to remain composed by staying in the moment and focusing 100% of your concentration on each play. Composure is the ability to stay even-tempered, level headed, or have a calm mind when you are challenged by mishaps or mistakes. Why is moving on from mistakes easier said than done? Well, you probably got to this level in soccer by pushing yourself, working hard, and wanting to perform better and better. Therefore, mistakes are hard to accept. However, moving on from setbacks is imperative to move to the next level. You rarely see professional soccer players dwell on past mistakes or losses. Their energy is directed towards the next play or game. 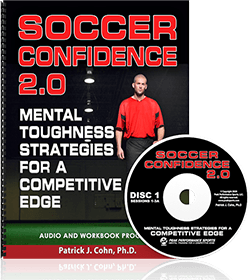 Instead of losing confidence after setbacks, the best soccer players use setback as a learning experience and an opportunity to improve. Composure is everything for the pros. 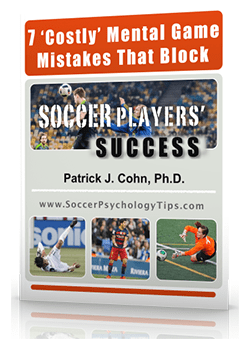 Making mistakes are part of soccer. But, you have control over how you react to mistakes. Decide in your mind that mistakes are inevitable and necessary to becoming a better athlete. They have to know they can’t be perfect. Give them 3 get out of jail cards each that they can use after mistakes. Help them move on with personal refocus statements.